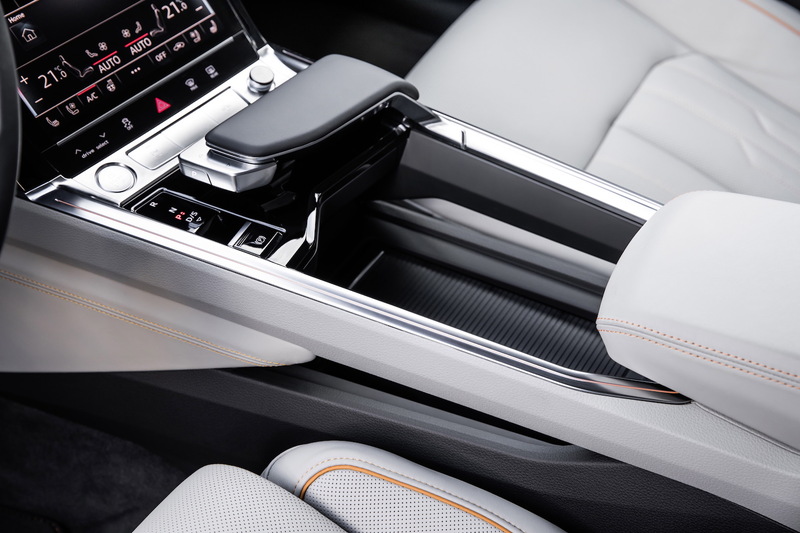 As part of its protracted run-up to the full unveiling of the company’s all-electric E-Tron SUV, Audi showed off the car’s interior at an event in Copenhagen last night, touting the new EV’s quiet ride, enhanced sound system, and high-tech features. The full unveiling of the car was previously scheduled for the end of August, but has been postponed to an undisclosed date this fall, partially thanks to the arrest of CEO Rupert Stadler on charges related to the Dieselgate controversy. 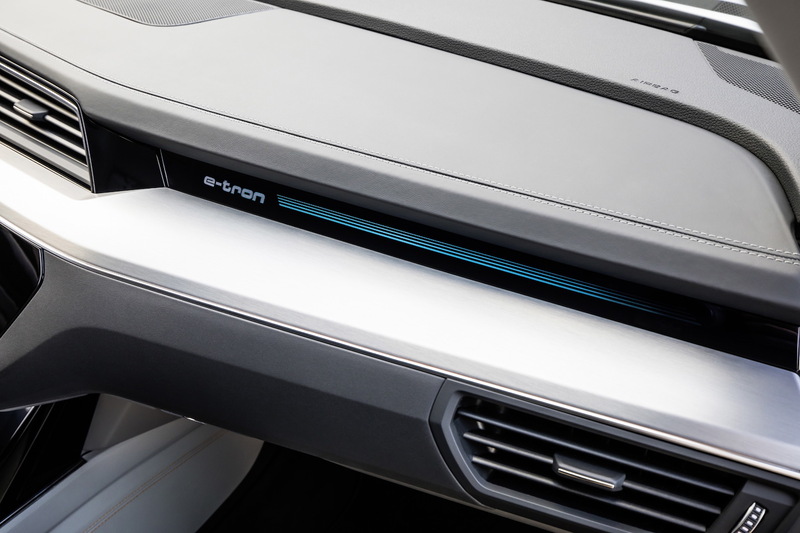 That bit of corporate awkwardness aside, the E-Tron’s interior shows promise for EV enthusiasts who groove on the characteristically futuristic interiors that usually come part and parcel with EVs, with the E-Tron exhibiting clean lines, colored stitching and piping in the leather, hints of electric symbolism in the graphics and trim details, like patterns inspired by circuit boards, and funky LED mood lighting at night. It’s all quite restrained in order to appeal to the widest customer base possible—a strategy also taken by Jaguar’s new I-Pace electric crossover—but it has enough to set it apart from the rest of Audi’s lineup, for sure. The most prominent of the tech goodies shown off are, of course, the only features we won’t get here in the states: virtual side mirrors. The slick system—the first to enter volume production, even though the idea has been around for years—replaces the wing mirrors with smaller, lighter cameras, reducing weight slightly, cinching up the width by six or seven inches, and severely cutting the wind noise that’s the bane of engineers’ existence. 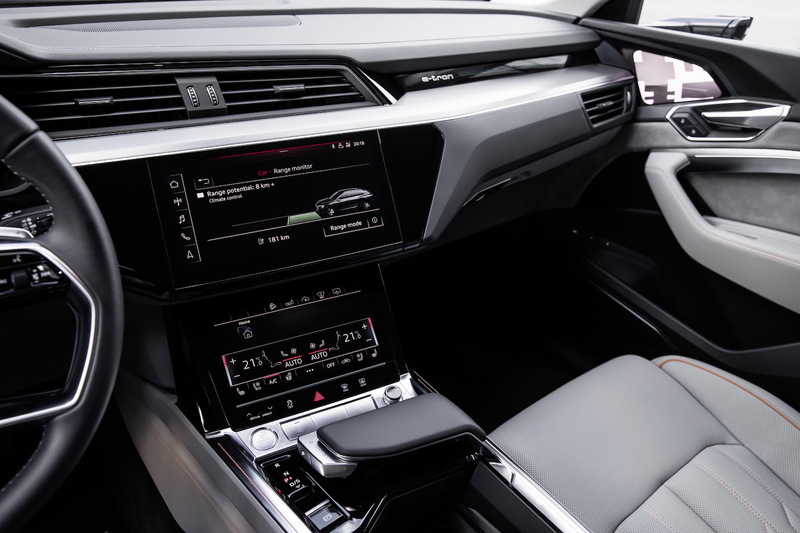 The views are displayed on seven-inch OLED screens directly below the window on the driver- and passenger doors, and they can be aimed and zoomed and configured with multiple pre-programmed settings that adjust the mirrors for highway driving, turning, and parking. 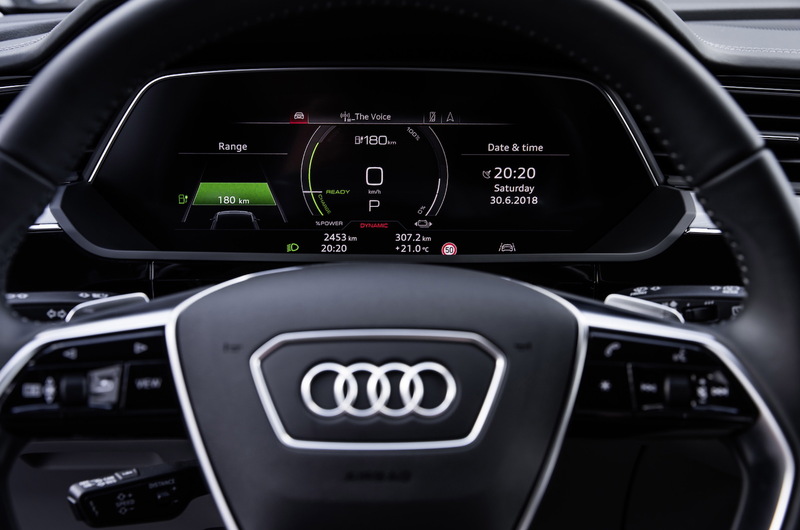 The Audi E-Tron's virtual mirror display. It’s all great fun, but alas, U.S. regulators have been dragging their feet for years with regard to permitting the mirrors, which numerous other automakers, including Tesla, have been begging for. Though no timeline has been given, Audi seems confident that the virtual mirrors could appear on U.S. roads within a year. 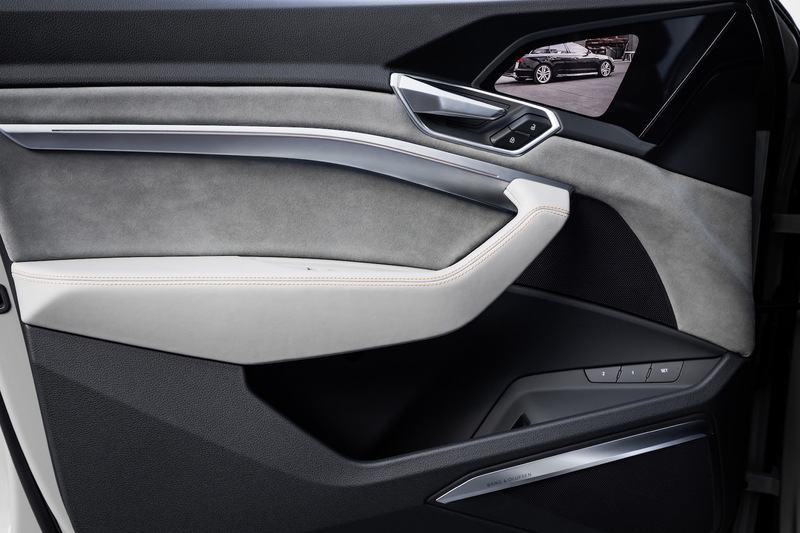 Elsewhere inside the new five-passenger E-Tron, the ethereal quietude of the car’s electric powertrain is being billboarded via an optional, 16-speaker, Bang & Olufsen-sourced 705-watt premium audio system, which you’ll be able to enjoy to the fullest in the absence of a droning engine in the background. 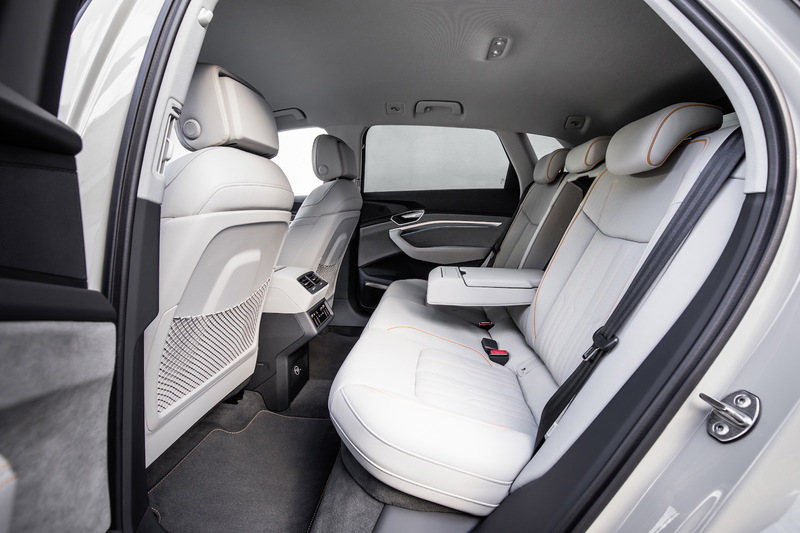 That kind of quiet is a key perk of EV driving, one that actually improves with premium vehicles, which tend to have greater soundproofing in general, as well as the built-in muffling that comes with greater mass. As great as interior details are, Audi’s 429 hp, three-motor all-wheel-drive setup, with a 95 kWh battery, will be the real proof of the car’s ability to take the fight to Tesla (and, now, Jaguar). Details are scant, but the company has indicated it would achieve a 250-mile range in the European WLTP cycle, and charging as quick as 30 minutes via a 150 kW station. It’ll start at $89,000, which is a good chunk higher than the slightly smaller I-Pace’s $69,500 starting point, and even high than most Tesla Model X's, including those with longer ranges. We should know everything about the car sometime in September, though, and will see how it all stacks up then.